Children in grades 3 - 5 are invited to explore the magic of circuits and 21st century STEM learning with LittleBits! 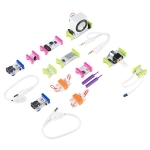 LittleBits is a platform of electronic building blocks for creating inventions that easily snap together with magnets. This program is for children in grades 3 through 5 and children will be working in pairs or teams to build an invention. Sign up is required. This program is sponsored by the Pollard Memorial Library Foundation.